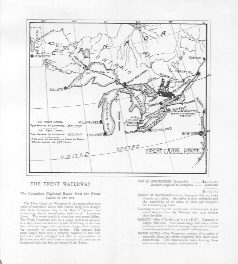 Page from Pamphlet "The Trent Waterway"
The Trent Canal or Waterway is the name given to a series of navigable Lakes and Rivers lying in a straight line from Georgian Bay to the Bay of Quinte, and connecting almost immediately with the St. Lawrence River. The water supply is abundant and never failing. The Trent Waterway will be a barge system as opposed to a ship canal and will be capable of floating in one tow four ordinary barges and one steam barge, with a carrying capacity of 120,000 bushels. 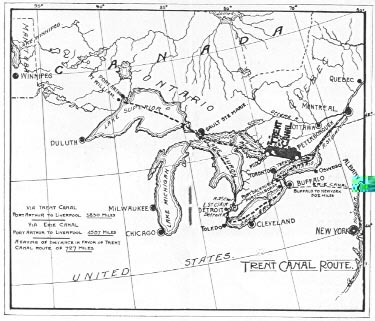 The present Erie canal barges have only a carrying capacity of 240 tons and even when enlarged and after an expenditure of [$101,000.000] will only have the capacity of 1,000 tons as compared with the 800 ton barges of the Trent. LENGTH OF WATERWAY – From Georgian Bay to Lake Ontario 203 miles. 160 miles is now navigable and the canalizing of 17 miles of river will complete the remaining 43 miles. Counting return trip the Trent route to Liverpool is 500 miles shorter than the Welland and 1500 shorter than the Erie. CAPACITY – Size of Locks 134’ x 33’ x 8’:6". Capacity of barges 800 tons. One steam barge will tow 4 ordinary barges with a united carrying capacity of 120,000 bushels – equivalent to 120 loaded railway cars. WATER SUPPLY – The Waterway consists of a series of navigable lakes and rivers requiring only short canal connections. The innumerable lakes feeding these waters makes the supply [inexhaustable].